Thanks to a Canadian specialist's ballistic protection. There's any number of superlatives we might apply to a vehicle like the new Mercedes G-Class: rugged, capable, luxurious... but bulletproof? Maybe figuratively, when it comes to dependability as the going gets tough. But one company has made it literally so. As in, all but completely impervious to projectiles from firearms. That company is Inkas, a Canadian firm that specializes in armoring all sorts of vehicles. And it's one of the first to reinforce the G-Wagen against armed attack, as we saw previously in extended form. Now it's applied its upgrades to the standard form, too. Inkas starts with the Mercedes-AMG G63 and upgrades it to CEN 1063 BR6 standards of ballistic protection – enough to withstand assault from high-powered rifles and multiple hand grenades detonated under its reinforced floor. But as you can see – or more to the point, not see – from these photos, you wouldn't necessarily be able to tell just by looking at it. Inkas hasn't disclosed exactly how much mass the ballistic reinforcements add to the vehicle's curb weight. 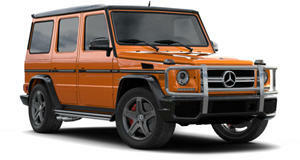 But the G63 is fortunately possessed of enough muscle to keep it moving out of harm's way. Chalk that up to the 4.0-liter twin-turbo V8, sending 577 horsepower and a prodigious 627 lb-ft of torque to all four wheels through a nine-speed automatic transmission.